On Saturday October 1st the entire Kingstone family will be in a frenzy! It is time for celebration with friends and fellows as Kingstone is on the reggae and dancehall map since 1996. 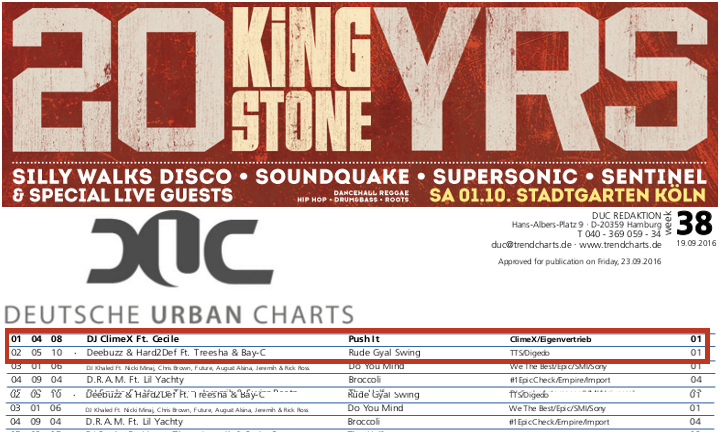 And just like a perfect match three artists from the Kingstone artist roster are topping the German Urban Charts with hit singles made to move your feet. Treesha and Bay-C have been doing extremely well with their notorious “Rude Gyal Swing” for 10 weeks. They are now on position #2 after beeing on top for several weeks. Most recently Ce’Cile has climbed on top of the board with her “Push It” produced by DJ ClimeX. The festivities on Saturday will take place in Kingstone’s homebase, the “Stadtgarten” in Cologne, Germany. The Kingstone Soundsystem has invited several special live & surprise guests. The flankers for the night on the main floor are Silly Walks, Sentinel, Supersonic and Sound Quake. Up in the foyer it’s going to be DJ Marious rocking the crowd away with his supreme party selection and the “Studio 672” in the basement is expecting heavy sound waves as the Bassliebe Crew will be in the house with nothing but the best from Dubstep and Drum’n’Bass.